ESA has published some new pictures taken by its Mars Express space probe that show a curious crater in the Terra Sirenum region on Mars. It’s a crater with an elongated shape having a length of about 45 kilometers (about 28 miles) and a width of approximately 24 kilometers (about 15 miles). It’s probably the result of an asteroid impact that broke up into three parts when it was still above the surface causing the triple impact of fragments that were still very close. The sedimentary deposits on the bottom of the crater suggest that in ancient times water existed in that region of Mars. The wide Terra Sirenum region in the southern hemisphere of Mars is full of craters but the triple one is definitely out of the ordinary. There are many overlapping craters but these are cases in which by coincidence an impact occurred very close to the area previous struck. The triple crater is the result of an event that occurred at the same time because the layers of debris thrown outside seem continuous and there’s a uniform thickness around the crater. 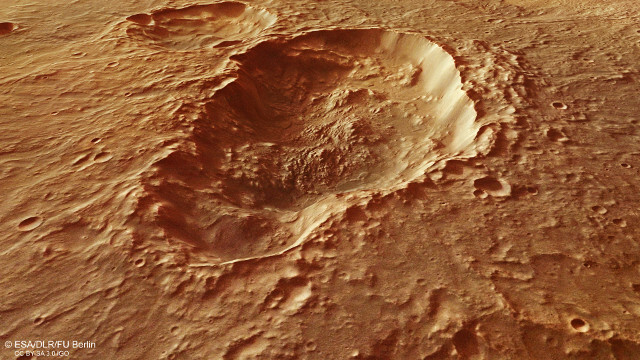 The difference from a crater formed by subsequent impacts is visible above the triple elongated crater. There’s in fact a large main crater with two smaller craters superimposed to it that have well-defined edges. This indicates that the two small craters were formed when the main one had already settled. The most likely hypothesis for the origin of the elongated crater is that an asteroid got fragmented while was plunging into Mars’ atmosphere and that the three fragments hit the ground so close as to create that crater. The asteroid, however, could have been broken due to the impact and two large fragments could have created two raters overlapping the first. According to a hypothesis a bit different the impact was caused by two or three asteroids bound by their gravity force which consequently hit Mars together. Another reason for interest about this triple crater comes from spectral analysis of clay minerals identified within it. 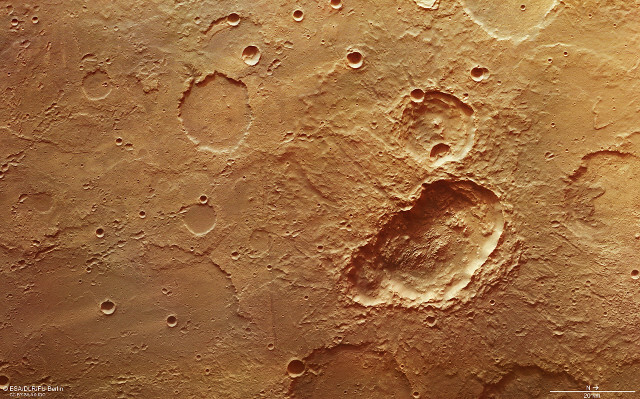 Both the OMEGA spectrometer aboard the Mars Express space probe and the CRISM spectrometer aboard NASA’s Mars Reconnaissance Orbiter space probably helped to map the presence of these minerals in various areas of the Terra Sirenum region. The presence of clay minerals indicates that there was once liquid water in that region. It’s possible that the older craters got filled with water to form lakes more than 3.7 billion years ago. The recent study of ancient geological and hydrological traces on Mars’ surface regularly show that when the red planet was young it was much more like Earth.